This chapter is intended as a broad introductory survey of technical details of seven blockhouses for which there is the most construction information. These seven examples cover the whole period of blockhouse construction in Canada. They also represent a wide range of shapes, sizes, functions and defensive situations. The seven blockhouses to be compared are Fort Edward blockhouse, Windsor, Nova Scotia; Fort St. Joseph blockhouse, St. Joseph Island, Lake Huron; St. Andrews blockhouse (west blockhouse), St. Andrews, New Brunswick; the octagonal blockhouse at Coteau-du-Lac, Quebec; The Narrows blockhouse on the Rideau Canal, Ontario; Fort Wellington blockhouse, Prescott, Ontario, and Madawaska blockhouse, near Edmunston, New Brunswick. Fort Edward blockhouse, built in 1750 by Colonel Charles Lawrence on a rise of land near the junction of the Avon and St. Croix rivers, stood just within the main gate of a small stockaded fort. It survives as the oldest blockhouse in Canada. Construction of Fort St. Joseph blockhouse was started in 1797; it was built after a design by Gother Mann, and stood in the centre of a square palisaded fort with bastions at all four corners. The whole fort was situated on the crest of the highest ground on the island and overlooked the south channel of the St. Mary's River. St. Andrews blockhouse (west blockhouse) was built by the inhabitants of St. Andrews in 1812. It stood on a point of land at the western extremity of St. Andrews harbour. The blockhouse was built to support a battery raised a few months earlier to protect the town against American privateers. The octagonal blockhouse at Coteau-du-Lac, built in 1814 on a triangular piece of land bordered on two sides by the St. Lawrence River and on the third by the canal which bypasses the Coteau rapids, was supported on the landward side by a ditch, palisades, redans and two other blockhouses. The sides of the triangle were defended by picketing and earth works and a battery was raised at the point. The Narrows blockhouse, which was built in 1831-32 as one of a series of fortifications protecting the Rideau canal, was located 70 feet south of lock no. 35 on the man-made causeway at the narrowest point in Rideau Lake, the top water level of the canal. Fort Wellington blockhouse, built in 1838-39, was the largest and most elaborate blockhouse attempted in Canada. It stood in the middle of a large, strong earthen redoubt beside the St. Lawrence River. The Madawaska blockhouse was built in 1841 at the confluence of the Saint John and Madawaska rivers. Situated on a rise of land due east of Little Falls on the Madawaska, it was built as a border post primarily to protect the portage route around the falls. It is clear from the construction details available for these blockhouses that a certain sophistication of building techniques took place with the passage of time. Blockhouses grew bigger, were more solidly built and more carefully planned, especially after the War of 1812. An important consideration in any attempt to see an evolution in blockhouse construction over this period is the element of planning. Those blockhouses which were built in peace time, or were considered important enough to be designed by an engineer, or were built when adequate time and money were available, naturally showed the effects of such considerations. But the majority of the 200-odd blockhouses erected in Canada were built to fill an immediate need. They were hastily constructed for very temporary purposes with a minimum of time, labour and money. Such blockhouses were closer to the rude American origins of the structure. Few records and fewer examples of this type survive. The blockhouse built on the Madawaska River in 1841 was one of the last to be erected, and it was also one of the most carefully planned. If any blockhouse could be considered to represent an ideal, it would be this one. Its basement had stone walls three feet thick. Two partition walls two feet thick divided this first floor into two rooms which served as magazine and artillery stores, and a commissariat store with provisions for 100 men. The two upper storeys were composed of pine logs hewn to 15 inches square, dovetailed together at the ends and secured with hardwood dowels. The top storey was turned diagonally on the one below. The middle storey contained 24 woodenberths and was used primarily as a barracks. The top storey had curbs and blockings for traversing guns immediately behind each of the four port holes. It was a well-planned and carefully built post. If lightning had not struck it in 1855, it might stand today as the best example of a blockhouse in Canada, and one of the most sophisticated blockhouses built in North America. Some 82 years earlier, in 1759, Major Patrick Mackellar, an engineer stationed at Halifax, sent a proposal to the Board of Ordnance for blockhouses to be built at Halifax. 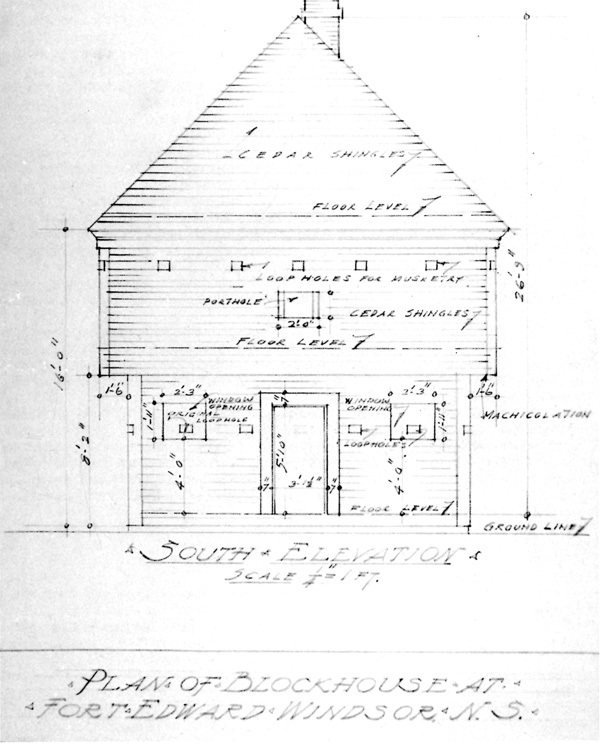 If Mackellar's proposals had been accepted, his blockhouses would have been identical to the Madawaska blockhouse, belying an evolutionary theory of blockhouse construction. Mackellar's proposal, even though it was never carried out, is good evidence that, even at the time of the early English settlement of Nova Scotia, engineers at least were aware of the utility of blockhouses and had clearly defined ideas about how to build good ones. The first, fundamental defence of the blockhouse, whether it stood alone or in a larger defence system, was the palisading which surrounded it. Originally it was the palisades which determined that blockhouses had second storeys. The picketing which formed a palisade was usually composed of cedar posts 10 to 14 feet long, pointed sharply at the top. A trench was dug into the ground below frost level and the pickets lined into it, sometimes in double rows. Wooden stringers attached to the pickets by nails or pegs stabilized and strengthened the line. Loopholes were cut through the picketing, and occasionally platforms were constructed so defenders could fire over the top of the pickets. Ditches were dug outside the palisade to present an even more imposing obstacle to those attackers who might have succeeded in reaching them. The Fort Edward blockhouse stood within a stockaded fort. The palisades, in this case, described the perimeter of the fort  a regular square 85 yards on each face, with bastions in the four corners. A ditch surrounded the picketing. The Fort St. Joseph blockhouse also stood within a stockaded fort, a square with bastions in the corners. Platforms were built inside the bastions to mount cannon. A ditch surrounded the palisades, as in Fort Edward. The St. Andrews blockhouse had a tall line of palisades connecting the blockhouse with the extremities of the breastwork, thus forming a sort of redan. The octagonal blockhouse at Coteau-du-Lac stood on a triangular piece of land bordered on two sides by the St. Lawrence River and on the third by the Coteau canal. The northwest side of this triangle, facing the river, was picketed as far as the battery which stood on the point. Documentary evidence would suggest that there was no picketing at The Narrows blockhouse. The Fort Wellington blockhouse stood in the centre of a strong redoubt built to withstand artillery fire. The palisades ran along the top of the high earthen ramparts; but palisading was of only secondary importance in the planning of this formidable redoubt. There is no documentary evidence of palisades at the Madawaska blockhouse. The walls of blockhouses were almost invariably built of hewn square timbers laid horizontally on each other. It was this thickness of wood which proved a relative security against musket balls and arrows. Long hardwood dowels or "tree nails" were pierced through adjoining logs at regular intervals to add strength. Small crevices between the timbers were caulked with a variety of materials. The interior walls were sometimes plastered, especially if any of the rooms inside were being used as barracks. The exterior walls were either clapboarded or shingled to prevent the rapid deterioration of the square timbers. If the walls were not covered at the time the blockhouse was initially built, they were usually covered when time or money became available. Those blockhouses along the Rideau canal which were built with stone lower storeys, the Fort Wellington blockhouse which was built entirely of masonry, except for the wooden gallery which ran along the outside of the third storey, and the Madawaska blockhouse, were exceptions in that they did not have square timber walls. These blockhouses were built in times of peace and were intended to be permanent fortifications; therefore more care was taken with their design and construction. The walls of the Fort Edward blockhouse were pine square timbers, nine inches high and six inches thick, laid horizontally. The blockhouse was a relatively small one measuring 18 feet square in the lower storey. The fact that it was prefabricated in Halifax and carried overland to its destination may, perhaps, account for the relative lightness of the timbers. 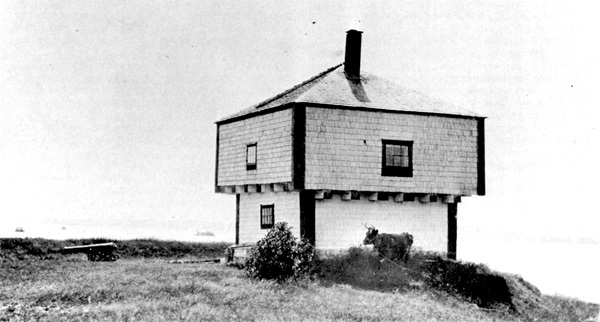 All the blockhouses used in the British conquest of Acadia were prefabricated like this one and carried by the troops to their respective posts. Smallness and lightness would have been an important consideration in the design of these buildings. The walls of the Fort St. Joseph blockhouse were of hewn square timbers approximately 14 inches thick. This blockhouse and others built to the same specifications (at Amherstburg and Fort George) were intended primarily as defensible barracks and were very large  26 feet by 96 feet. Single timbers of that length were, of course, unmanageable, and so logs of different lengths were married at irregular intervals. The internal arrangement of rooms and framing provided much-needed lateral support in these structures. Cedar shingles covered the exterior of the St. Joseph blockhouse, but were later replaced by sheet iron as fire prevention. The walls of the St. Andrews blockhouse were hewn timbers 12 inches square. The exterior was covered with cedar shingles. This blockhouse measured 18 feet 6 inches square in the lower storey. The walls of the octagonal blockhouse at Coteau-du-Lac were of square timbers, laid horizontally on an octagonal plan. The lower storey of The Narrows blockhouse was of stone masonry 30 inches thick and 10 feet high. Munitions were stored on this floor, which accounts for the thickness of the walls. The blockhouse was square, 24 feet on a side in the lower storey (exterior measurement). The second storey was built of hewn cedar logs 15 inches square. The walls of Fort Wellington blockhouse were entirely of grey stone, hammer dressed. The lower two storeys had walls four feet thick; those of the third storey were two feet thick. The exterior measurement at the base of the blockhouse was 50 feet on a side. The Madawaska blockhouse was three storeys high. The foundation rested on bedrock, so the basement (which was 7 feet high) was exposed. The walls of the basement storey were stone, three feet thick. The two upper storeys were of pine logs hewn 15 inches square, and were secured by strong hardwood dowels two feet long placed every three feet. The exterior of the first floor of the blockhouse measured 30 feet square. The knowledge of a variety of cornering techniques was integral to the development of horizontal log construction in the early American colonial period. In Canada there is little variation in such techniques in those blockhouses still extant. Only two cases seem to have deviated from the predominant dovetailing method of cornering. At Fort Edward blockhouse, the earliest for which there is any information, the timbers were simply halved at the ends and nailed together. This blockhouse and a number of early blockhouses built in Nova Scotia were prefabricated in Halifax and shipped with the troops as they established posts. Either the French (whom Governor Cornwallis employed to square the timber) were unfamiliar with the sophisticated methods of dovetailing or  more likely  it was thought that simply halving the ends of the timbers would facilitate the erection of the blockhouses when they reached their destinations. The only other case where dovetailing seems not to have been used was the octagonal blockhouse at Coteau-du-Lac. Here, Red River frame construction may have been used: the logs were laid horizontally but were mortised to vertical posts at the corners. This type of frame was used extensively in western Canada; the best example is the bastion blockhouse at Nanaimo, British Columbia. Those blockhouses which had stone walls, of course, followed the whims and training of the professional masons who built them. Overhang and machicolation were archaic defence features, but ones which gave the blockhouse its distinctive form. The device of machicolation was a simple one derived from mediaeval fortification techniques, and made a good deal of sense in the early days of Indian warfare. Holes were cut through the floor of the overhanging upper storey so the defenders could direct a downward (or machicoulis) fire on an enemy who had breached the palisades and reached the blockhouse. The second storey thus provided a place of final retreat; it could conceivably have meant the difference between a successful and an unsuccessful defence of the post. The second storey itself was an important feature of the blockhouse's defence. Because the second storey stood higher than the palisades, a garrison armed with muskets and a small amount of ordnance could direct a formidable fire in all directions. In some blockhouses the top storey was turned diagonally on the lower, thus reducing the amount of machicoulis fire which could be brought to bear, but allowing the total fire-power of the blockhouse to be used more efficiently. The Fort Edward blockhouse was built with an overhang of 17 inches on all four sides. Machicoulis fire could be directed by removing boards 11 inches wide which ran around the whole perimeter of the upper storey. Fort St. Joseph blockhouse had an overhang of 18 inches around the perimeter of the building allowing machicoulis fire to be directed downward through loopholes cut through the floor of this overhang. Plugs were fitted into the loopholes when they were not in use. The St. Andrews blockhouse had an overhang of two feet on all four sides. Loopholes were cut through this projection. 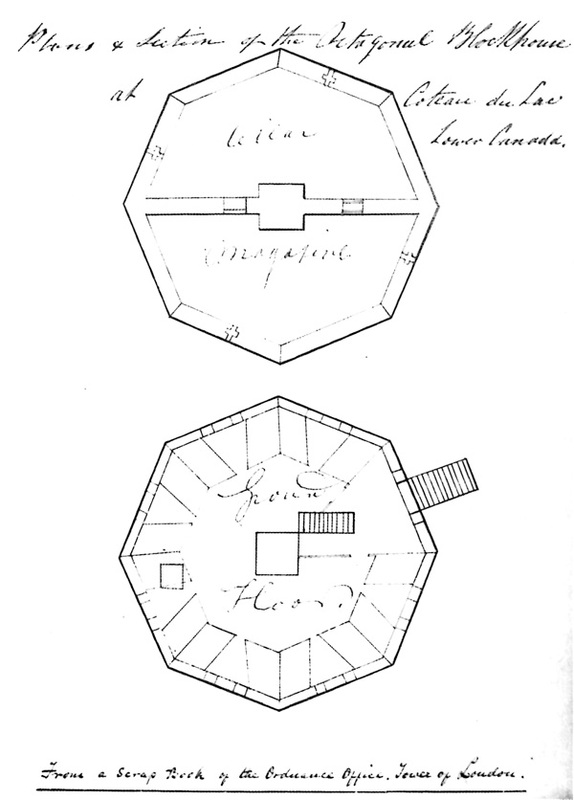 The octagonal blockhouse at Coteau-du-Lac had an overhang of 18 inches on all eight sides. There is no information available on machicolation. The Narrows blockhouse was built with a two-foot overhang around the perimeter of the second storey. Machicoulis fire could be directed through four portholes cut in the overhang located in the middle of each wall directly below the loopholes. The gunports consisted of a removable pine board 16 inches by 3 feet 4 inches by 2.5 inches thick. The Fort Wellington blockhouse is the one instance of blockhouse construction in Canada in which the overhang was actually a separate gallery around the perimeter of the third storey. It was a framed wooden gallery three feet wide supported by huge stone corbels projecting from the top of the second storey. Eight doors led out to this gallery from the third-floor barrack area. Machicoulis fire could be directed through loopholes located between each set of corbels. Removable boards covered these loopholes when not in use. The top floor of the Madawaska blockhouse was set diagonally on the lower. Machicoulis fire could be cut through the four projecting angles, where loopholes were cut along the base of the triangle formed. Loopholes were cut through the walls of all blockhouses. The garrison could fire at assailants in the open area around the blockhouse without exposing themselves. Loopholes were splayed on the outside and toward the bottom to allow a defender a wide angle of fire. The Fort Edward blockhouse had 23 single-rifle loopholes in the lower storey and 24 in the upper. The holes were 4.5 feet above floor level. Each loophole was cut and angled in such a way that lines drawn through the centres of all of them would meet in the middle of the blockhouse. This is an interesting feature and one which gave the blockhouse an effective 360-degree field of fire. On the evidence of the available plans, there were no loopholes in the lower storey of the Fort St. Joseph blockhouse. The reconstructed blockhouse at Fort George, built on the same plan, does have loopholes in this storey. The second storey of the Fort St. Joseph blockhouse had loopholes which were long horizontal slits cut around the whole perimeter of the fort, centred between the portholes. A board, hinged above, covered the openings when they were not in use. There is no information available on loopholes for the St. Andrews blockhouse. 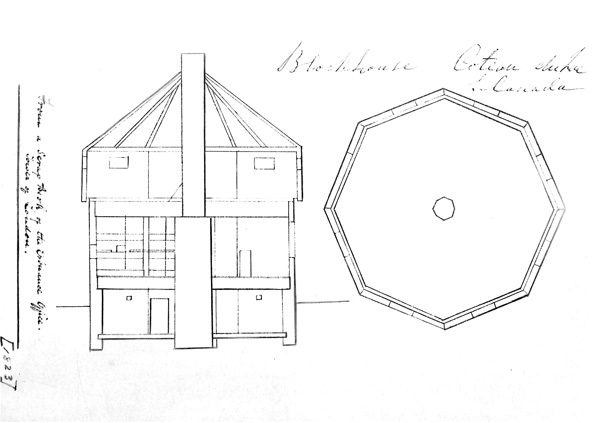 There is some confusion from plans and later pictorial evidence concerning the octagonal blockhouse at Coteau-du-Lac. It appears that in the first storey there were horizontal loopholes in each face on either side of the central windows. The second storey had long horizontal loopholes above the portholes in each bay. These would also have let out smoke when the cannon were fired. There were no loopholes in the lower storey of The Narrows blockhouse since it was used for storing munitions and provisions; however, there were small ventilation ports. The second floor had one horizontal loophole 4 feet long and 4 inches high in each of the four sides. They may have had wooden plugs when not in use. Single-rifle vertical loopholes were cut in the south and southwest walls of the ground floor of the Fort Wellington blockhouse. The magazine, armoury and storeroom on this first floor were ventilated. In the second storey, single-rifle vertical loopholes were cut through the stone, each splayed outward and downward. Like the blockhouse at Fort Edward, all were angled in such a way that lines drawn through their centres would meet in the middle of the building. In the wooden gallery which formed the overhang on the blockhouse, the loopholes were six-inch square holes, 14 of them on each side, cut through the thin gallery walls. The Madawaska blockhouse had eight horizontal loopholes, each eight feet long, separated by the four portholes. The same arrangement existed in each storey. The openings were filled with two-inch pine glazed sashes. Pine stoppers were hinged under the loopholes to reduce the opening when necessary. Portholes were cut in all blockhouses. They served the double function of gunports for ordnance to fire through and ventilation ports. The openings were splayed to allow guns to pivot in order to increase the field of fire. Portholes were ordinarily cut into the upper storey, since that floor projected above the palisades and any ordnance mounted would be most effective there. Large openings in the lower storey were usually cut higher in the walls and were intended as windows. The Fort Edward blockhouse had four portholes in the upper storey, one in the centre of each side. The openings measured 1.0 feet 5.5 inches high and 1.0 feet 7 inches long. The bottom of each porthole was 1.0 feet 6.75 inches above the floor. The original ordnance consisted of four-pounders without carriages. Cornwallis was supplied with 40 of these guns for the blockhouses he contemplated. They probably rested on swivel mountings. There were four large openings in the lower storey of the Fort St. Joseph blockhouse  undoubtedly windows. On the second storey there were six porthole-windows in each of the long sides and one in each of the short sides (located near the corner to provide light for the stairwells). Most likely these openings were simply windows for light and fresh air, since the upper storey was used as a barracks. The openings were 3 feet 9 inches above the floor and had ledges on the outside. Since there were guns mounted on platforms in the four bastions of the fort, it seems doubtful that anyone ever intended to mount ordnance in the blockhouse. The St. Andrews blockhouse had two windows with side-hinged shutters, located in the side of the lower storey, facing the water. There were four portholes, one in the centre of each side, in the upper storey. The blockhouse mounted one four-pounder iron carronade on a standing wooden carriage. The first floor of the octagonal blockhouse at Coteau-du-Lac had openings two feet square in the centre of each face. They were three feet above the floor. Since this was a barracks room, these openings, with shutters hinged outside, were undoubtedly intended as windows. In the second storey was a rectangular porthole measuring 1.5 feet high by 4.5 feet long in each of the eight faces. These portholes were placed close to the floor. Since the blockhouse was apparently fitted up to mount a 24-pounder on a traversing platform on this floor, these openings were intended as gunports. The long slit above each porthole could serve as a loophole, and would also allow the smoke from the large gun to escape. There were two portholes in the east, west and south walls and one in the north wall of The Narrows blockhouse. The north wall porthole retains the original dimensions  33.5 inches long 26.5 inches high. The other portholes were later enlarged for windows. No information is available indicating what, if any, ordnance was mounted. The four large openings on the second floor of the Fort Wellington blockhouse are quite high in the wall and suggest that there was no intention of mounting ordnance here. There are also windows in the gallery of the third storey. 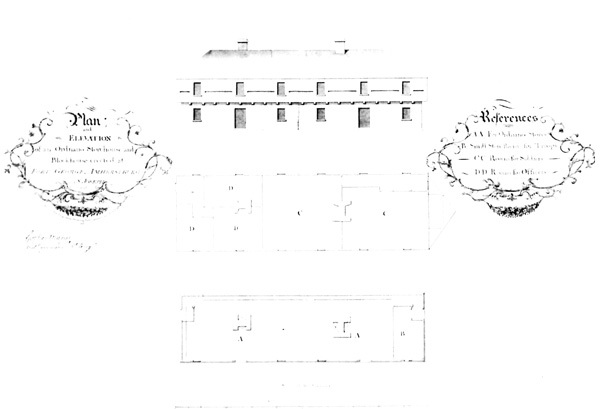 The 1838 specifications for the blockhouse instructed the contractor to make the windows in the French or English style, with two-inch-thick frames which were to be glazed. There were four portholes, 2 feet 8 inches square, in the centre of each side of the top storey of the Madawaska blockhouse. There is no available information about the nature of the ordnance mounted. A plan of the blockhouse indicates curbs and blockings immediately behind each gunport, suggesting that a traversing gun was intended. All the blockhouses had pitched roofs, necessary (for obvious reasons) in the Canadian climate. The nature of these roofs was naturally determined by the shape of the underlying blockhouse. Square blockhouses  such as those at Fort Edward, St. Andrews, Fort Wellington, The Narrows and Madawaska  had pyramidal roofs. The king-post type of support was the rule in these cases, the king-post often reaching from the peak of the roof through two stories to the foundation. 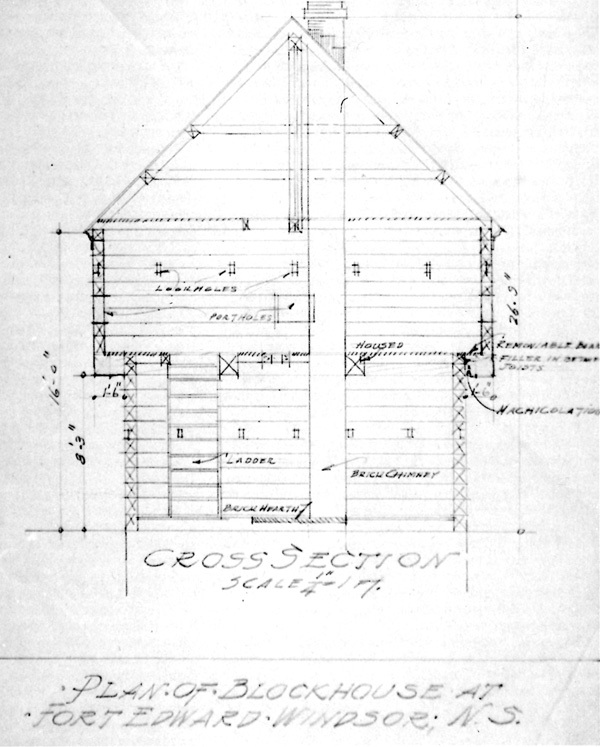 The long rectangular blockhouse at Fort St. Joseph had a hipped roof with queen-post truss support. The octagonal blockhouse at Coteau-du-Lac had an octagonal hipped roof, with rafters spanning from each of the eight corners and the middle of each face, all bearing on the central chimney. The roofs were usually covered with cedar shingles, although the blockhouses at Fort St. Joseph, Coteau-du-Lac and Madawaska had roofs covered with sheet metal. Fort Wellington had a tin-covered roof. An attempt was made at Fort Wellington to make the roof splinter-proof by filling the space between the tie beams and the roof with a solid layer of nine-inch-thick cedar poles. The floors of the blockhouses were invariably laid with two-inch-thick softwood planking. In the early period, blockhouses were heated by simple hearths or fireplaces. As stoves became more readily available in the late 18th century, these marvelous inventions were introduced. Most blockhouses had central brick chimneys and could be adequately heated with one or two stoves, although the larger ones (at Fort St. Joseph and Fort Wellington) needed more elaborate heating systems. At Fort St. Joseph, the blockhouse had two interior chimneys, each with two fireplaces on each floor, making a total of eight fireplaces in the two storeys. The blockhouse at Fort Wellington had two brick chimneys with a number of stoves feeding into them on all three floors. Ideally, the blockhouse served best when it was designed as a self-sufficient defensible post  the magazine, armoury, store house and barracks all combined in a single building. Money, time and labour frequently made it necessary for blockhouses to serve all of these functions even when they were not designed to do so. They were so easy and cheap to construct, one of the more adaptable types of fortification, and had few limitations. In general the blockhouse was considered an extremely practical defense structure. The Fort Edward blockhouse was the principal work inside Fort Edward. It was probably used only occasionally as barracks because the fort contained barracks sufficient for 200 men. Ordnance was mounted on the second storey, which was used mainly as a watchtower. The lower storey probably contained small arms and was used as a guardhouse since it was situated near the main gate. The Fort St. Joseph blockhouse was constructed as a blockhouse-barrack. 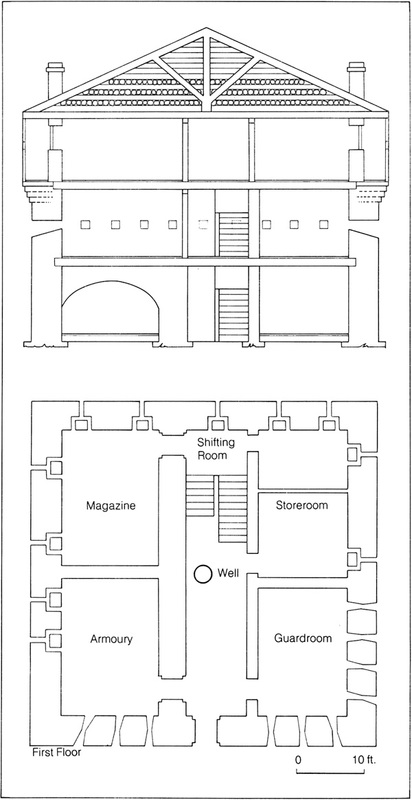 The lower storey was subdivided by wooden partitions into four rooms: an ordnance storeroom; a room for provisions and commissary stores; a room for the Indian Department stores, and a regimental storeroom. The upper storey was divided into two large barracks for soldiers and three smaller ones for officers. The St. Andrews blockhouse was constructed by the townspeople of St. Andrews to discourage American privateers. It was used as a small-arms depot and also as a barracks for the artillerymen. Local militia on active duty also used it. The second storey mounted a four-pound carronade. The basement of the octagonal blockhouse at Coteau-du-Lac was divided into two sections by a stone wall; one room served as a powder magazine, the other as a cellar for provisions. The first floor was fitted up as a barracks with three-tiered bunks along the outer walls. The top floor was intended to mount a 24-pounder on a traversing platform, but it is doubtful if the gun was ever actually installed. For a time in 1815, the top floor was used as a garrison hospital where hammocks were hung for the patients. The first floor of The Narrows blockhouse was an unpartitioned munitions and provisions store. The second storey barrack would have contained about 20 men, but was usually the residence of the lockmaster and labourers. The Fort Wellington blockhouse was the largest and most elaborate in Canada. The first floor of the three-storey stone building was divided by thick walls into four rooms and a central corridor. The magazine, located in the northwest corner, measured 20 feet by 14 feet and was vaulted. The armoury, in the southwest corner, was identical to the magazine. The other two rooms in the first floor were storerooms, each of which measured 22 feet by 14 feet 9 inches by 10 feet high. The second floor was divided into two rooms and, apparently, used as barracks. The third storey was also used as barracks with a small room later partitioned off as a hospital. The gallery around the third floor was planned to be used only for defence. The first storey of the three-storey Madawaska blockhouse was of stone. A partition wall two feet thick divided the area into two rooms. One room served as a commissariat store with provisions for 100 men; the other as a magazine and artillery store. The second storey of the blockhouse was used as barracks. Eight wooden berths were headed against four posts supporting the upper floor, and 16 more bunks were situated against the walls. Hammocks could also be hung to accommodate additional men. The third floor had curbs and blocking behind each porthole to mount a traversing gun.